What connected citizens in the selected Smart Cities of India want? New Delhi, India, August 27, 2015 – LocalCircles (https://m-www.localcircles.com/a/), India’s leading Citizen Engagement platform today shared collective insights from citizens of the 70+ selected Smart Cities of India on what they want from the Smart City Mission for their city. 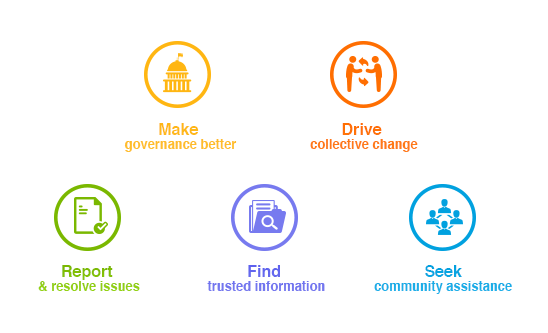 The online citizen communities were enabled for over 160 cities in June 2015 upon the launch of the Smart Cities Mission bringing together citizens in these cities to discuss what it would take for their city to become a smart city on the ground and other local issues related to civic, traffic, law/order, governance, emergency response, health, etc. With this exercise, collective citizen insights have been generated on Smart Cities using a bottoms-up approach. Now that citizens are already connected across these 70+ selected Smart Cities (and being connected in the remaining 28 selected Smart Cities), it is incumbent upon their respective urban local body to engage with the citizens. “In this day and age of technology and social media, connecting with citizens is just a few clicks away, said Sachin Taparia, Chairman and CEO of LocalCircles”. “These local, city level online citizen communities have been set up with the vision that urban local bodies will be able to easily seek citizen inputs on their initiatives, invite them to on the ground events, utilize citizen expertise as fit, update them on progress and challenges and truly make Smart Cities dream a reality with citizen participation”, continued Taparia. Citizens in many of these online communities are already discussing traffic, civic, safety, infrastructure and many other local governance issues as well as their solutions. Citizens in the communities belong to varied backgrounds ranging from RWA leaders, Senior Citizens, Social Workers, Homemakers, Doctors, Small Business Owners and Professionals, essentially representing a microcosm of the city, accessible on fingertips. LocalCircles will soon have several other citizen communities in each one of these Smart Cities for other citizen needs like Law & Order, Health, Emergency/Blood Assistance, Consumer Issues and Swachh Bharat. All citizens who want to join their city’s online local community are welcome to Sign Up on http://www.localcircles.com and Find their respective City Circle. Once they are a member of one circle, they will be invited based on their background and interests to other local circles available. LocalCircles.com takes citizen engagement to the next level and makes it about Communities, Governance and Utility. It enables citizens to connect with communities for most aspects of urban daily life like Neighborhood, Constituency, City, Government, Causes, Interests and Needs, seek information/assistance when needed, come together for various initiatives and improve their urban daily life. LocalCircles is free for citizens and always will be!